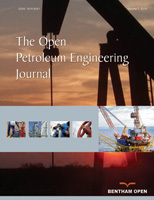 The Open Petroleum Engineering Journal is an Open Access online journal, which publishes research articles, reviews, letters and guest edited single topic issues in all important areas of petroleum engineering including reservoir engineering, reservoir simulation, drilling, completions, testing and evaluation, nonconventional oil and gas reservoirs, equipment-manufacturing technology, production engineering, reservoir management, petroleum geology, enhanced recovery, compaction/diagenesis; petroleum economics, geomechanics, mathematical modelling, petroleum geochemistry, construction and design, materials and corrosion control. The Open Petroleum Engineering Journal, a peer-reviewed journal, is an important and reliable source of current information on important developments in the field. The emphasis will be on publishing quality papers rapidly and making them freely available to researchers worldwide.